16th July 2010 – Sometimes we need a little motivation and inspiration to help us from day to day. Here’s a nice collection of quotes from designers, artists and other people with their views on design. I think that math is hard,design is very hard. Wise words and really inspirational. These are excellent Starr. Well done on WDM Nice to see it’s gone from strength to strength. 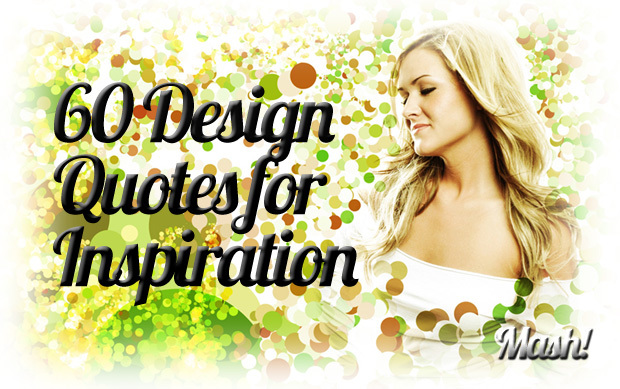 60 design quotes for inspiration | Web Design Mash http://bit.ly/k0O8K9 Some classics! @myen RT @ohh_la_la: 60 design quotes for inspiration | Web Design Mash http://bit.ly/k0O8K9 Some classics! I’m hooked! Can’t stop reading. Haha. I’ll post some on my profiles. Hope you don’t mind. BIG THANKS! nice little collection of quotes about designers! Good design means never having to say “Click Here.”- Shawn Leslie http://t.co/7JrAouKp – quite clever, I should say. Thanks for the great quotes! Enjoy! 60 Design Quotes For Inspiration http://t.co/vZqdOBN6 via @webdesignmash I love this! "People ignore design that ignores people." I just used some of these to inspire my team. Thanks.